Attorney Eric T. Taylor grew up with motorcycles. His father was injured in a motorcycle crash. When he meets with you to talk about your motorcycle accident and injuries, you can count on empathy. Please contact our Tampa law office today for a free consultation and thorough assessment of your legal options. We counsel and represent many personal injury victims in Tampa Bay and surrounding areas including St. Petersburg, Clearwater, Brandon, Lakeland, Bradenton, and Sarasota. We also assist surviving family members who seek just compensation for a wrongful death. From a diligent, honest case evaluation through resolution of your case, we can help you obtain compensation that does justice to your situation. As the victim of a motorcycle accident, you deserve a lawyer who will fight for your rights and your future. You deserve a voice. 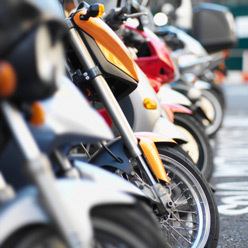 Almost without exception, motorcycle accident and motorbike crash victims know the risks when they take their bikes out on the road. The greatest of these risks is other negligent drivers: People in cars and trucks who violate your right of way and later say, “We didn’t see that motorcycle.” It is important for every cyclist to know that a driver may be just as negligent in hitting your motorcycle as if he or she had hit a large commercial truck. Our approach to all roadway accidents includes a complete investigation to determine fault and liability, as well as attentiveness to your medical needs, including carefully documenting your injuries. We follow up on any traffic violations and citations issues, in order to build the best case possible for your financial recovery. And best of all, you do not collect fees unless we win. For the caring, experienced legal counsel you need after a motorcycle wreck or other serious accident, you can turn to a lawyer who has been serving the Tampa, Florida, area for nearly 15 years. You will not owe attorney's fees or expenses unless we win a settlement or verdict for you. Please consider putting our dedicated legal team to work on your behalf. Call us today at 813-259-4444 to meet with us. Our Tampa law office is conveniently located on Kennedy Boulevard, just off of I-275, close to I-4 and I-75. We are a short distance from St. Petersburg, Clearwater, Brandon, and Lakeland.